We have been in our house for over a year now and the all beige walls are starting to wear on me. Our home was absolutely beautifully renovated, but to save time and I’m sure money, the company just painted all the rooms the same basic beige in this horrible flat paint. Every time something barely grazes the wall, the paint gets horrible scratched and nicked up. The only room in the house that is not beige is my massage room. We painted that a lovely green. I’ve managed to convince Dan that painting some of our rooms should be our house project for this summer. I’ve had enough basic beige! 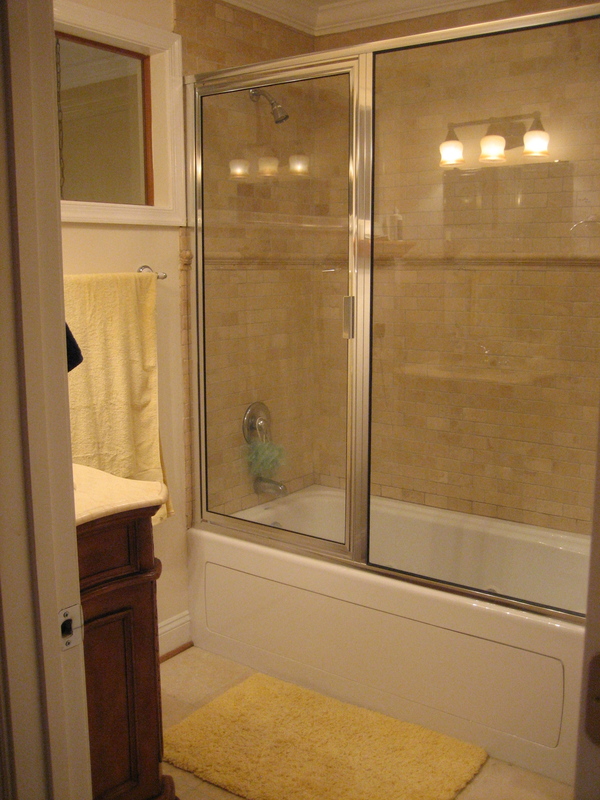 That being said, I would like to keep our bathroom very earth toned. We have really nice stone in there and tile around the bathtub and I think a nice earthy color would look really nice and I wouldn’t have to worry about it clashing with our yellow and blue towel sets. Here’s a shot of our bathroom. This is from when we first moved in. We actually have a little more blue in there now. And here are some colors that I think would be good options. Feel free to share your thoughts or suggestions. I’ll be posting paint color ideas for the living room next!